There are currently people looking for the Uniden BC-UTGC GPS USB cable that is used with the SDS100 and BCD325P2 (see pictures below). This topic was being somewhat discussed in another RR thread (https://forums.radioreference.com/uniden-prospective-owners/372694-sds100-status.html) from post #10 on but I figured it was more appropriate for the topic to have its own thread. 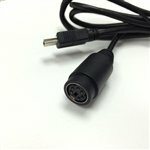 If anybody knows of any other source(s) to purchase the cable please post your information and link(s) for the benefit of others who are looking for this cable. Note that we are working to expedite arrival of another batch of BC_UTGC cables. Currently hoping to get these aired in for July arrival. Not very many people used these with the BCD325P2, so the sudden surge in demand when SDS100 came out caught our parts buyer by surprise. We quickly sold out of what had previously been a 12-18 month supply. I called UFOS where I placed my order Wednesday night and he confirmed they are out of stock. I told him to keep my backorder on order. That seems like a smart move seeing that the Factory Outlet Store's price for the BC-UTGC cable is $19.95 with FREE shipping included. Shipping charges on small orders like this from some vendors/dealers can be significant especially when compared to the selling price of the item being purchased (see my post #1 above). Yeah I&#8217;m not really in a big hurry for it. I used my gps with my 436 yesterday and it worked magnificently well. Just as an FYI the "$3.95 ship" that you posted above is only if you select "Priority Shipping" when you check out. If you select "FREE Shipping (2-5 Business Days)" there is NO charge for shipping. 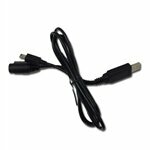 For those who are still looking for the Uniden BC-UTGC GPS USB cable for the SDS100 or BCD325P2, Scanner Master now has them in stock (as of 13:00 EDT on 08-06-2018). If you want one I would act RIGHT AWAY as none of the other online dealers are currently showing any stock on their respective websites. Ordered mine! Hoping they ship in the next few days as I have a trip coming up. Could you share the pinouts of the Uniden BC-UTGC cable? I just bought the SDS100 and the GPS receiver but it came with the wrong cable. I would really like to get it working. Thanks! Isn't that the same information that I posted 3 1/2 hours earlier in my post #9 above directly above your post #10? In addition to including the direct link to the SDS100 GPS cable at Scanner Master I even included the price and shipping information. They're in stock and shipping from Scanner Master.